Today, those features have mostly vanished, much to the chagrin of long-time subscribers. Although you can get some of them back using workarounds How to Restore the Best Features Spotify Has Removed How to Restore the Best Features Spotify Has Removed Spotify may be the best music streaming service available, but it has shed a few features in recent years. Find out how to get the best lost features of Spotify back for good. Read More , it’s clear that Spotify’s priorities have shifted away from the social aspects of the platform. What Is Vybes for Spotify? 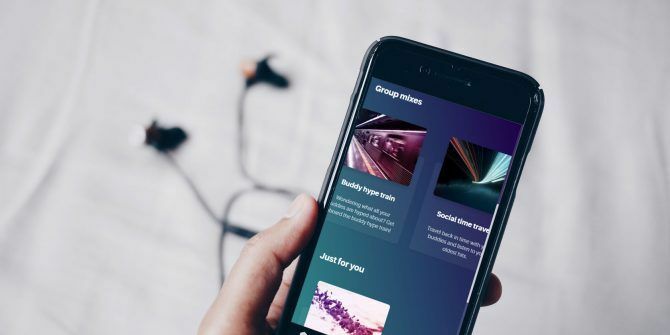 At its core, Vybes is an app which allows you to enjoy Spotify music with friends. You can share music with them 6 Awesome Ways to Find and Share Music Playlists 6 Awesome Ways to Find and Share Music Playlists Streaming music services are growing ever more popular, and this means the ability to create and share playlists with family and friends have got easier than ever. Here's how to do it. Read More , use their musical tastes to discover new music for yourself, and listen to tracks together at the same time. At the moment, the app is in beta, but you can sign up and have a poke around. The full app is expected to go live in late 2018. The app is available on the web, Android, and iOS. If you’ve been a long-time user of Last.fm, you’ll have tens of thousands of scrobbles linked to your account. Potentially, they stretch back a decade or more. Vybes can use your old Last.fm data to create playlists for you. To listen to a stream of songs you’d long since forgotten about, check out the Blast from the Past feature. Note: In order to use Vybes features, you need a Spotify Premium account. If you’d like to learn about more ways to discover new music How to Discover New Music Using Spotify: 7 Key Tips and Tricks to Know How to Discover New Music Using Spotify: 7 Key Tips and Tricks to Know The main reason I love Spotify is that it has helped me find so much new music over the years. Here are the built-in Spotify features I used to discover awesome new music. Read More , check out our article on websites to find new music genres 8 Websites to Help You Discover New Music Genres 8 Websites to Help You Discover New Music Genres Broadening your musical horizons by discovering new or niche genres can be beneficial. With that in mind, here are several essential websites for discovering music you've never heard before. Read More you’ll love.